Jonathan Djanogly, MP for the Huntingdon constituency, has welcomed new measures from the Government to ensure young people and small businesses feel the full benefits of the successful expansion of apprenticeships. 370 people started an apprenticeship in 2009/10. 610 people started an apprenticeship in 2010/11. This means the number of people starting an apprenticeship increased by 240 last year. Offering cash bonuses for taking on young apprentices. The Government will offer employers with 50 employees or fewer up to £1,500 for taking on an apprentice aged between 16 and 24. 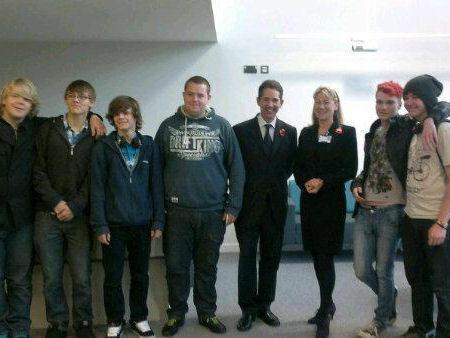 This will support up to 20,000 new apprenticeships in 2012/13. Making it quicker and easier for employers to take on an apprentice. The National Apprenticeships Service and training providers will be required to ensure that every employer is able to advertise a vacancy within one month of deciding to take on an apprentice. Targeting apprenticeships where they are needed. We are renewing the programme’s focus on younger adults, new employees, higher level qualifications and particular sectors where apprenticeships can make the greatest impact. Equipping apprentices with basic skills. Apprenticeship providers will be required to offer all apprentices training in English and Maths up to the standard of a good GCSE. Ensuring high standards. We will launch a review into the standards and quality of apprenticeships, undertaken by a leading employer and reporting in the Spring. Huntingdonshire Regional College in particular has experienced exceptional growth in their Engineering Apprenticeships over the last two and a half years: from 7 to 70 current engineering apprentices. The College has also seen a similar pattern of growth in Business Administration apprenticeships. Apprenticeships that are being offered are showing excellent signs of take up from employers, with Child Care and Dental Nursing being particularly well received. ‘240 more people in the Huntingdon constituency area are benefiting from an apprenticeship thanks to the government’s extra investment. This is great news not just for these individuals, but also for the whole local economy. ‘Until now, too many businesses have been put off taking on an apprentice because of unnecessary bureaucracy and red tape. It is therefore good news for businesses and young people alike that the government is streamlining the system.